The carnitas taco makes no attempt to disguise its meat-filled interior. 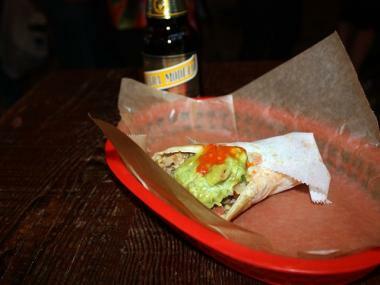 UNION SQUARE – In the six months since it started serving up authentic California-style burritos in the heart of Manhattan, Dos Toros Taqueria has earned rave reviews from aficionados of the West Coast staple who’d nearly given up on finding the real thing on the East Coast. But vegetarians who thought they were safe ordering the “Basic (no meat)” burrito are in for an unhappy surprise – since all the rice in the restaurant is made with chicken stock. 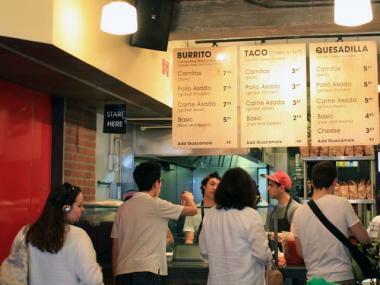 “The signage is completely misleading, that was totally our fault,” said Dos Toros co-owner Leo Kremer, who opened the restaurant on Fourth Avenue at 13th Street with his brother Oliver after moving here from Berkeley, Calif.
Customers line up to order at Dos Toros Taqueria in Union Square. But the Dos Toros online menu still listed the previous description as of Thursday afternoon, news that came as a surprise to Kremer. He promised to change it immediately. While he’s willing to change the website, the food is a different story. The debate over the rice recipe is one of the subjects at the heart of the East Coast-West Coast burrito war. 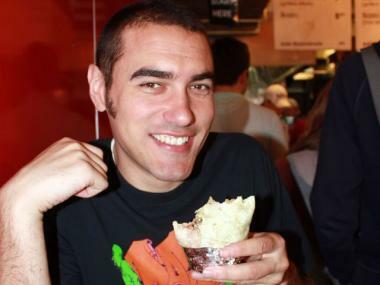 The owner of one of California’s most popular burrito shops, Gordo Taqueria in San Francisco, said rice is the most important ingredient of a perfect burrito. Manhattan’s chief rival burrito maker, Chipotle sells cilantro-flecked vegetarian rice, but has a less-than-impressive reputation on foodie websites like Yelp.com. Among the chief complaints about the typical Manhattan burrito are poor rolling techniques, dry tortillas, un-melted cheese, and stale pico de gallo salsa. 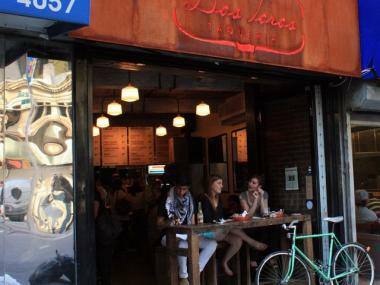 “Shame on you if you can go to Chipotle after eating here,” Yelp user Grace L. wrote after tasting a Dos Toros burrito. Happy customer Sean Spillane digs in to a burrito at Dos Toros. Kremer said his restaurant’s rice is a “huge part of that difference” between his burrito’s “warmer and more authentic flavor” and the competition. He denied trying to mislead Manhattan’s vegetarians. He said any customers asking about vegetarian options would be told about the chicken stock. “In the Bay Area, a lot of places do put chicken stock in their rice and they don’t tell anyone,” Kremer said. Dos Toros Taqueria storefront on Fourth Avenue and 13th street.